« 285 new voters confirmed registered from Sarawak Road Shows! Important annoucement: To all relatives in friends and Sarawak, particularly Sebangan and Sebuyau, Numpang Suntai is again being called by the Police to come to Serian on December 15, which is this coming Wednesday at 8:00 am. Please come to Serian in support of my brother Numpang Suntai. I am sick and tired of the harrassement from the Police on my family, while the illegal loggers go free and continue on logging in Ulu Sebangan. Please show your support to Numpang Suntai who is being summoned by the Police to come to the SERIAN Police Station, instead of Simunjan on Wednesday, December 15th 2010 at 8:00 AM. As far as I know, he is the only one of the Sebangan Seven that is being called!!!! Remember they were doing blockade against loggers, Quality Concrete Holdings, to stop them from bulldozing their NCR lands and forests on October 15th 2010. On October 18th 2010, a fire broke out in the logging camp, 4 kilometers away from the blockade, destroying equipment and the camp itself. The logging company accused the villagers of setting the fire. On October 21st, a total of seven villagers were arrested, including my brother Numpang Suntai but were released on October 25th 2010. One of the logging company of Quality Concrete Holidings’ owners is Taib Mahmud’s sister, Raziah Mahmud. The logging company who destroyed people’s farm, rubber and fruit trees and stole trees from NCR forest, go free! Is this justice? Is this how power is being used in Sarawak? Punish and harrass people who tried to hold on to their temuda and kampong galau while the land robbers and timber tycoons go free? We are not against people from getting rich or “ngelaban perintah.” We are against people who steal trees from our “Kampong Galau” and destroyed our land with bulldozers, muddied Sebangan river and polluted our drinking water! The Sebuyau and Sebangan Ibans need your moral and financial support to fight against illegal loggers. Your contributions will support the candidate of our choice for N22 to WIN in the forth coming General Election in Sarawak, Malaysia. This candidate will be our voice and our representative in our struggle to hold on to our Native Customary Lands and Forests in Borneo. 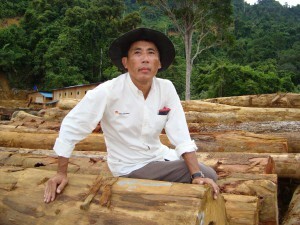 We desperately need a representative who will stop further destruction of land and forests of Borneo. The land and forest is our life line, our means of survival, without land and forests, we the Dayaks, the natives of Borneo are on the path of extinction.